Tropical coconut candle fragrance is a popular scent for candle buyers and makers alike. This summery fragrance evokes images of palm trees, warm breezes, and relaxing on the beach. It's no surprise then that these coconut scented candles seem to appear just as the warm weather kicks in. On its own, a coconut fragrance is rather plain. It's a sweet, warm scent with just a touch of fruitiness. To create a decidedly tropical coconut candle fragrance, other scents are added to create a blend. With the main note being coconut of course, here are some candle scents that can be added to make a tropical coconut fragrance. If you're blending your own tropical coconut fragrance, consider adding a musky base note to hold it all together, such as sandalwood or amber. Add just a bit at a time until you get the smell you're after.All of these scents, which are mostly fruit and flower smells, add to the coconut to give an overall tropical impression. The addition of vanilla gives the blend depth and adds a bit of sweetness. Keep in mind that some vanilla fragrance oils can color your candle wax slightly, giving it a touch of a brownish hue. You can usually find coconut scented candles wherever you normally purchase candles. They are most visible during the late spring and early summer, when the weather turns warmer and people are thinking of beaches and lazy afternoons. Here are a couple of candle companies that offer unique tropical coconut candles. The Island Soap Company is based in Hawaii, so you'd expect some interesting, deliciously scented coconut candles from them. They certainly don't disappoint!Coconut scented candles come in a variety of shapes and sizes including pillars and votives. One of the most fun items they make is the Monkey Pod candle, which is highly scented and presented in a "monkey pod," a bowl that is hand-crafted from Hawaiian wood. These candles are all made from natural beeswax. Scentsy candles are unique in that they don't require an open flame to burn. The candles are actually wax bars with a low melting point, and "burn" using a Scentsy warmer.Two of the most popular scents in the Scentsy line are coconut based, called Coconut Lemongrass and Coconut Palm. The latter includes patchouli fragrance, which gives it a deep, heavy scent. If you're a candle maker or want to learn the basics of making your own candles, a tropical coconut fragrance lends itself to many different candle projects. For something a little different, used real coconut shells as the container for your candles. All you need to do is cut a coconut in half, and then trim down the sides until you have a "bowl" about two to three inches tall. Sand down the edges so they aren't sharp, and sand a little off the very bottom of the bowl so it sits flat. Make sure you don't take too much off the bottom though, as you don't want to create a hole where the hot candle wax will seep through. Add a tabbed wick to the center of the bowl. Melt your chosen type of wax and add candle dye, if desired. 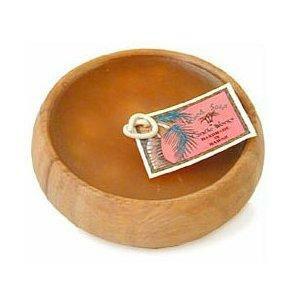 Then add a tropical coconut fragrance or fragrance blend, and pour the scented wax into the coconut bowls. Let the wax harden and set, and you're ready to use your candles. Coconut shells also make great tea light candle holders, especially if you can find coconut scented tea lights to place inside. Using tropical coconut candles inside your home can give you a little taste of the islands without actually going on vacation. Use tropical coconut candles anywhere in your house to create a warm and inviting scent.